We love the design of this bride's Jimmy Choo shoes. As photographers, we know how much time the bride spends choosing each and every one of her bridal details and we want to make sure we capture them all in a unique way. As specialists in Mexico destination weddings, we always search for ways to incorporate a sense of place in our imagery. 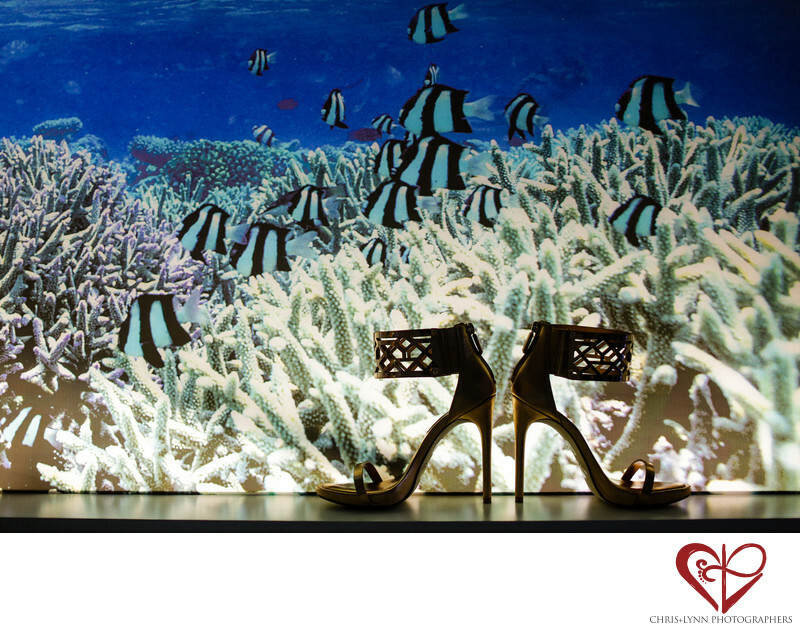 Thus, the tropical fish jumped out at us as the perfect backdrop for this wedding shoe shot. Since the day we first stuck our toes into the warm Mexican Caribbean waters almost 20 years ago, we always knew the Mayan Riviera was our destiny as wedding photographers. Now all these years later we love returning to our home near Playa del Carmen and photographing weddings from Cancun to Isla Mujeres to Tulum to Bacalar. As wedding photographers, our favorite wedding venues in Cancun, Playa del Carmen and the Riviera Maya include Le Blanc Spa Resort, Nizuc Resort & Spa, Rosewood Mayakoba, Fairmont Mayakoba, Banyan Tree Mayakoba, Belmond Maroma Resort, Zoëtry Paraiso de la Bonita Riviera Maya, Viceroy Riviera Maya, Dreams Riviera Cancun Resort, The Ritz-Carlton Cancun, Grand Bahia Principe Tulum, Thompson Playa del Carmen, and the Grand Hyatt Playa del Carmen. 1/1250; f/2.0; ISO 1600; 50.0 mm.